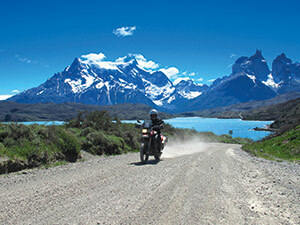 Edelweiss Bike Travel has provided the world with the finest choices in motorcycle and scooter touring around the globe since 1980. 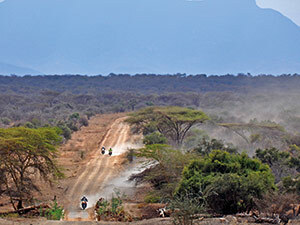 Since our company’s inception, we’ve increased the variety of experiences available, making Edelweiss the undisputed leader in guided motorcycle tours the world over. 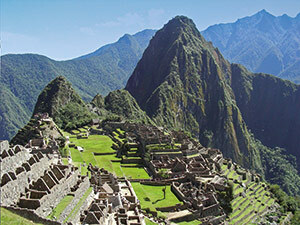 Never before have there been so many different opportunities to be a world traveller. 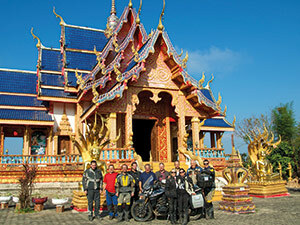 You can join our Around the World motorcycle expedition and circumnavigate the globe in a single stretch. You can choose to explore planet Earth, continent by continent, by doing sections only. 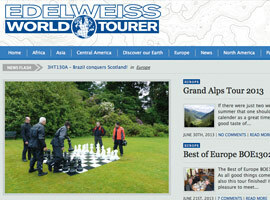 Or you may decide to add pieces to your personal world tour puzzle by taking several Edelweiss tours over the years. Whatever your approach may be, we offer excellent choices for everyone! And it’s not only the vast array of countries we enable you to explore, we also provide you with the latest and most-desired motorcycles. The hotels, chalets and resorts we stay in are carefully selected to suit our clientele and Edelweiss tour guides are famous for their expertise, helpfulness and friendliness. So with our more than 34 years of experience we are providing motorcycle and scooter travelling at its best! 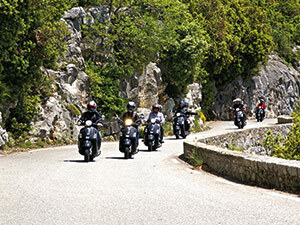 Up to now, more than 34,300 customers have been on an Edelweiss tour somewhere in the world and have experienced the benefits of the world’s leading motorcycle touring company. 30+ years of experience in motorcycle touring worldwide you can rely on. 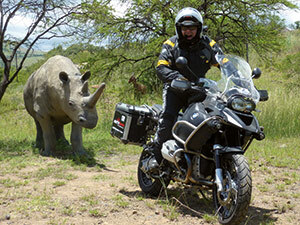 We have recognized over the years that the single most important aspect of guided motorcycle tours is the safe ride. In addition to some tours, we offer an optional supplementary, one-day training – the Alps Riding Training. Our Edelweiss policy is very clear about one thing: you don’t have to stay with the group during the day’s ride on nearly all tours. You are free to ride the route of your choice every day in a little group of your own or you can join the tour guide and benefit from his knowledge and experience. A support vehicle accompanies most of the tours (according to the tour category), which allows you to ride free of luggage and to bring along enough clothing to feel comfortable during your whole vacation. On most of our tours you will be pleased to find your luggage already in your hotel room after a full day of fine riding. The Edelweiss Worldtourer program for our repeat customers will render further benefits, such as additional overnights, motorcycle upgrading or tours at half the price. 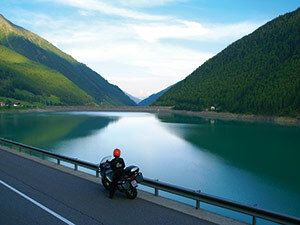 Are you interested in motorcycle tours worldwide? 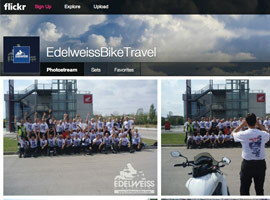 Do you want to learn more about the experiences and adventures of Edelweiss Bike Travel? Are you joining one of our tours and want to share your experiences as they occur with friends and family? Visit www.worldtourer.com and find exciting reports from our tours around the world. 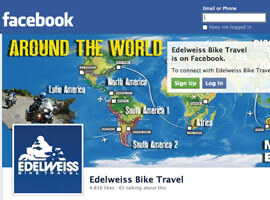 It has never been so easy to stay in touch with friends of Edelweiss Bike Travel. You have questions about your next tour or want to give future Edelweissers advice? Then visit www.facebook.com/edelweissbike and like us! 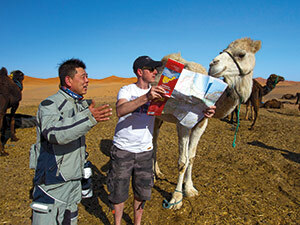 It doesn’t matter how much detail a tour description includes, pictures are worth a thousand words. It’s very easy to share your pictures taken on tour with your fellow riders and to make sure that they appear on the Edelweiss website, too. Create your own FlickR account at www.flickr.com and upload the images from your latest Edelweiss adventure. 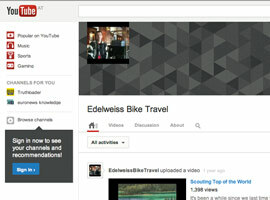 If you want to upload your tour videos to be shared with Edelweiss customers worldwide, you can easily do so at www.youtube.com after creating your personal account. Your next motorcycle or scooter tour is just a click away and the team of Edelweiss Bike Travel is looking forward welcoming you on tour!